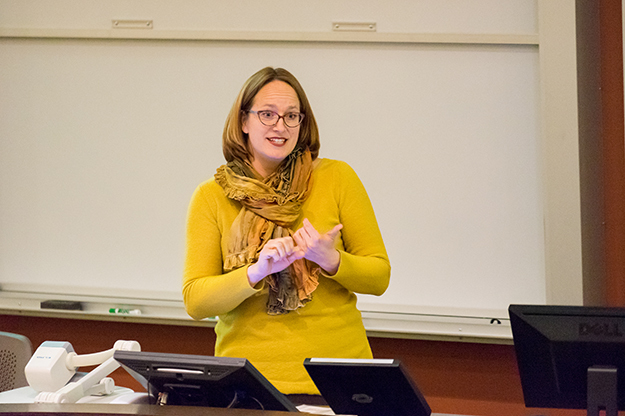 At the most recent forum for the new University Strategic Plan, Associate Professor of Languages Melissa Gjellstad (pictured) and English Professor Rebecca Weaver-Hightower explained strategies for meeting the Learning pillar’s first goal—providing a strong liberal arts foundation. Photo by Tyler Ingham. On the unseasonably wintry Wednesday of April 26, UND Strategic Planning Committee co-chair Dana Harsell welcomed a snow-dusted crowd to Education Building Room 7. 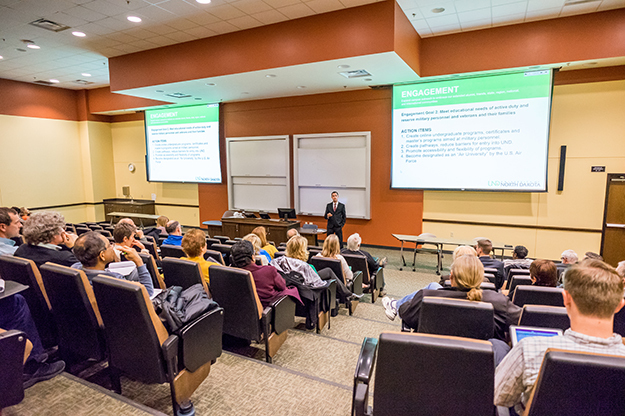 “First, I want to thank you all for venturing out on this November afternoon,” he said to the chuckles of the staff and faculty who braved the elements to hear more about the nearly-finalized Strategic Plan. At the prior week’s budget forum, Vice President for Research and Economic Development Grant McGimpsey led a discussion on the plan’s Discovery pillar, focused on advancing the University’s research efforts. Now, the conversation would center on the remaining two pillars—Learning and Engagement. Several Strategic Planning Committee members took turns outlining the goals of those pillars, and the action steps the planning group believes will help the University achieve those goals. Associate Professor of Languages Melissa Gjellstad and English Professor Rebecca Weaver-Hightower explained strategies for meeting the pillar’s first goal—providing a strong liberal arts foundation. The committee found that offering—and tracking—experiential learning opportunities through High Impact Practices (HIP) focused on intensive writing, research, diversity, service and internships was crucial in developing the liberal arts skillset. A mandatory first year experience course was also recommended. 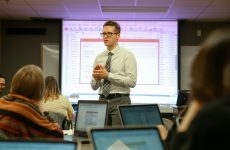 “First year experience courses are tied to retention, and they’re tied to all sorts of great learning goals, so it’s exciting that that’s one of the action items here,” Weaver-Hightower said. Professor Duane Helleloid of the College of Business and Public Administration (CoBPA) addressed the second goal of the Learning pillar—increasing graduation rates. The plan calls for full use of the student success platform Starfish for faculty and advising relationships, as well the implementation of a standardized Degree Planner to serve as a “roadmap to degree” for students. “It’s much easier for students, advisors and—to the extent that they have access to it—parents, to help students plan their degrees and achieve that four-year graduation rate,” Helleloid explained. Helleloid described how UND will identify the reasons some courses have higher DFW (drop/fail/withdrawal) rates and find ways to lower those rates. He also illustrated how the institution plans to reduce graduation barriers and optimize financial aid incentives to attract and retain students. The final goal of the Learning pillar—delivering more educational opportunities online and on-campus—can be met by increasing online and graduate programs. The intended outcome is a 10 percent increase in student credit hours. Presenter Mike Mann, executive director of the UND Institute for Energy Studies, said a renewed investment in marketing, promotion of high-demand programs, and initiation of sought-after degrees and certificates like analytics and cybersecurity will help to meet that goal. He added that upgrading the look and feel of campus through efforts like “Coulee to Columbia” would also bring more students to UND. “We want to make it as attractive a campus as we can, so when students and parents come to visit the campus, they say, ‘Wow, this is someplace I want to be,’” Mann said. Interim CoBPA Dean Steve Light articulates a portion of the new Strategic Plan’s Engagement pillar that embraces the education needs of active duty and reserve military personnel. He said UND has been recognized as a military-friendly institution, and can build on that. Photo by Tyler Ingham. Associate Vice President for Diversity & Inclusion Sandra Mitchell transitioned the forum into the Engagement pillar. “The way that we are looking at engagement in the Strategic Plan is not just on-campus engagement, but we’re actually looking at engagement in the community, engagement in the state, nationally and internationally,” Mitchell told the crowd. Mitchell described the process by which UND hopes to “foster a welcoming, safe and inclusive campus climate” by seeking full University participation from underrepresented students and assessing campus climate on a regular basis. “Climate affects whether students continue or leave our institution, and whether they are successful at our institution,” she said. Interim CoBPA Dean Steve Light articulated the next section of the Engagement pillar, which embraces the education needs of active duty and reserve military personnel. Light said UND can strengthen its outreach with more flexible and portable online programs and certificates aimed at military personnel, and by reducing barriers for admission and enrollment. 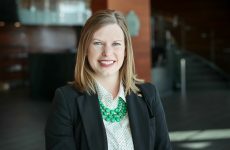 UND Alumni Association and Foundation CEO DeAnna Carlson Zink rounded out the Engagement pillar speakers by describing the ways in which UND can use alumni engagement to attract more financial support for the University. Recommended action steps include finalizing a process for crowdfunding initiatives, increasing marketing and communication integration with University Relations and Public Affairs & Marketing, and boosting alumni donor retention. “It is expensive to bring a donor on the first time. So boy, once you have them on, you want keep them,” she said. Carlson Zink said personalized engagement and stewardship will be key to keeping donors interested. “We are expanding our ‘thank you’ strategy for first-time givers—making sure they know that their gift was important, that they didn’t just give that first gift and it went into a black hole,” she said. UND Professor of Biology Bill Sheridan was the first to throw out a question. Harsell responded that throughout the process, there have been a number of outlets for discussion. UND Geography chair Greg Vandeberg asked about the first Learning pillar goal of providing a strong liberal arts foundation. 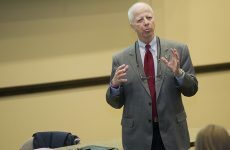 “As I look at the action items, I’m only seeing one as really targeted toward the liberal arts,” he said, questioning how that was going to produce the intended strong foundation. A couple of attendees asked about opportunities for further feedback on goals and action items. Harsell said he would like to see open dialogues throughout the process. President Mark Kennedy will lead a formal rollout of the Strategic Plan on May 5 at 2:30 p.m. in the Memorial Union Lecture Bowl.